The current group of enthusiastic trainee meteorologists, from left to right: Melissa Oosterwijk, Jessie Owen, Lewis Ferris, Andrew James, Kathryn Boorman, Tahlia Crabtree, Juliane Bergdolt. Front: Ashlee Parkes. So how do you become a meteorologist? The atmosphere is a thin film of fluid bound by gravity to the Earth. The Earth is a rotating sphere, heated more by the sun near the equator than near the poles. Circulations in the atmosphere transport excess heat away from the equatorial region. These circulations, some of which are weather systems, are well described using highly non-linear fluid-dynamical equations. 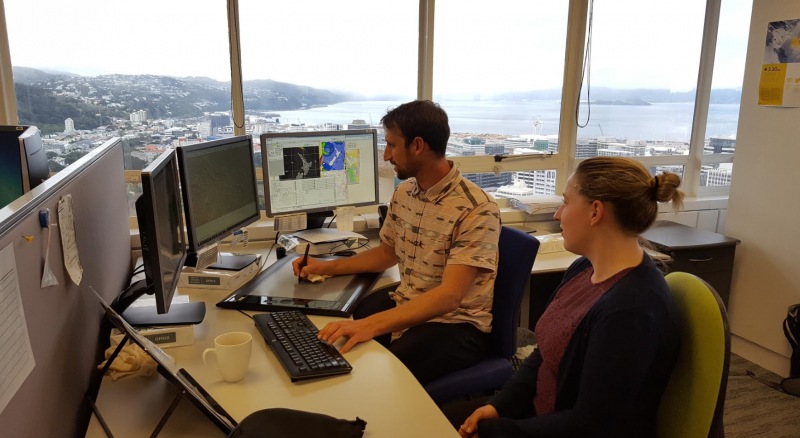 A new group of trainees is employed by MetService on average every second year. For the first few months of training, our trainees do not do much forecasting. Instead, they spend their time learning about observing the atmosphere, and understanding what is happening here and now. There are many different ways that we observe the atmosphere, for example: radar, satellite imagery, observations from land based weather stations, observations from ships and buoys, weather balloons, and yes, even looking out the window. An example of satellite imagery, courtesy of the Japanese Meteorological Agency (JMA). On the left is an ‘infra-red’ image which measures the temperatures of the cloud tops, and on right a ‘visible’ image, which is just like a photo. Trainees learn to interpret these images and distinguish different cloud types. While learning about observations, the trainees also begin their formal university qualification in meteorology at Victoria University. 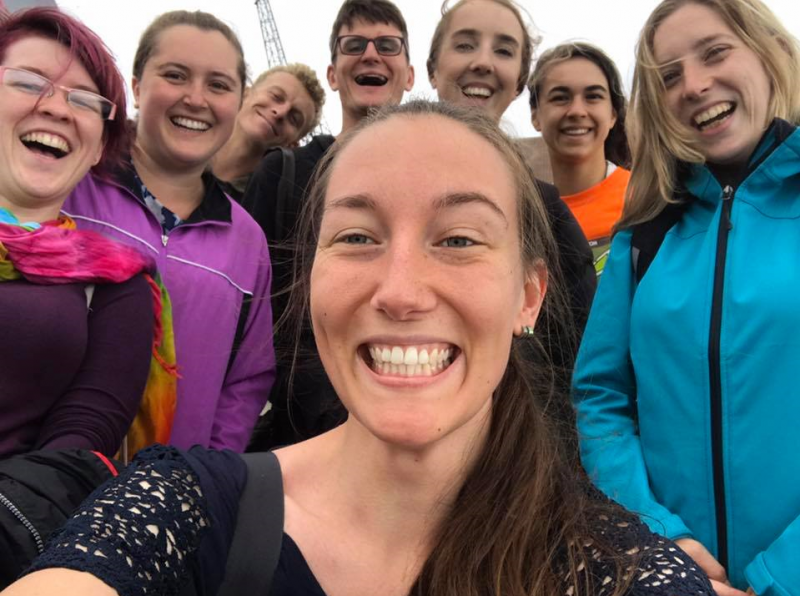 Our most recent training group are lucky to be able to complete a Masters of Meteorology, which is a new qualification in New Zealand (previously it was offered as a Post-Graduate Diploma). Their Masters course begins with courses on Fluid Dynamics, Radiation, Thermodynamics and Weather Systems, and trainees have to pass exams on these topics mid-year. Why are those topics important for the understanding of meteorology? Fluid Dynamics – this is the study of how fluids (liquids and gases) flow. This is important as the atmosphere is a fluid, and its movements are what cause our weather. Radiation – the sun emits electromagnetic radiation, which is absorbed and re-emitted by the Earth, and is the source of energy on our planet. Understanding how radiation is distributed over the globe is important to understanding what causes our weather systems. Thermodynamics – this is the study of heat and energy. This is important to understanding how heat is transferred in the atmosphere (and also the ocean). Weather Systems – in this course, our trainees learn about lows, fronts, highs etc. The things you see on your average weather map! An example of a thermodynamic diagram, called a tephigram, which meteorologists use every day. Trainees learn how to interpret these in their thermodynamics classes. The left black line shows ‘dew point temperature’ while the right black line shows temperature throughout the atmosphere (height shown on the right most axis). Once the foundations have been laid, our trainees undergo their first Simulation Week. Trainees are expected to understand and interpret weather information in real time, while working to strict deadlines to simulate the forecast room environment. They also work a combination of morning shifts and night shifts, just like our qualified meteorologists who write your daily forecasts. During the first simulation, the focus is on understanding the work flow and working to deadlines, as opposed to forecasting. Trainees are expected to produce work to a high standard to pass their first simulation. 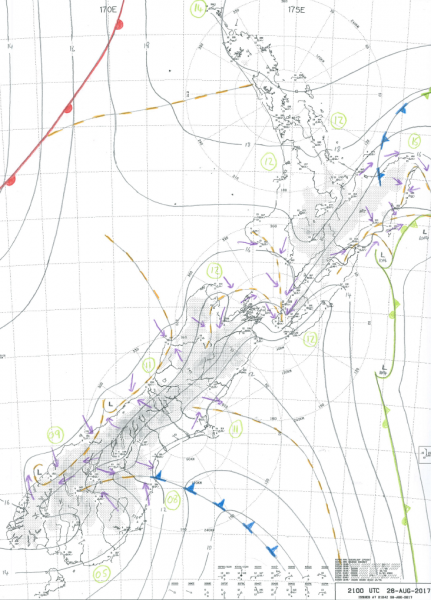 An example of the type of weather chart drawn by trainee meteorologists in their first simulation – these are drawn based on land-based observations from weather stations. Numerical Weather Prediction (NWP) – this course teaches how the mathematical equations that predict the future state of our atmosphere are implemented as part of a computational model. Climatology – while a meteorologist is concerned with short-term weather predictions (whereas a climatologist studies long-term weather trends), it is important for a meteorologist to have an understanding of how our climate changes with time. Cloud Microphysics – this is the study of how clouds form on a microscopic scale, and how we get things like symmetrical, six-sided snowflakes. 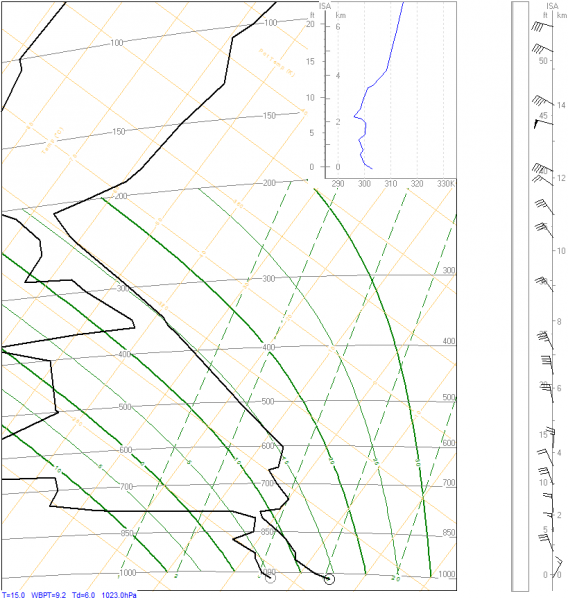 Boundary layer meteorology – the ‘boundary layer’ is the lowest layer of the atmosphere, which we all inhabit. 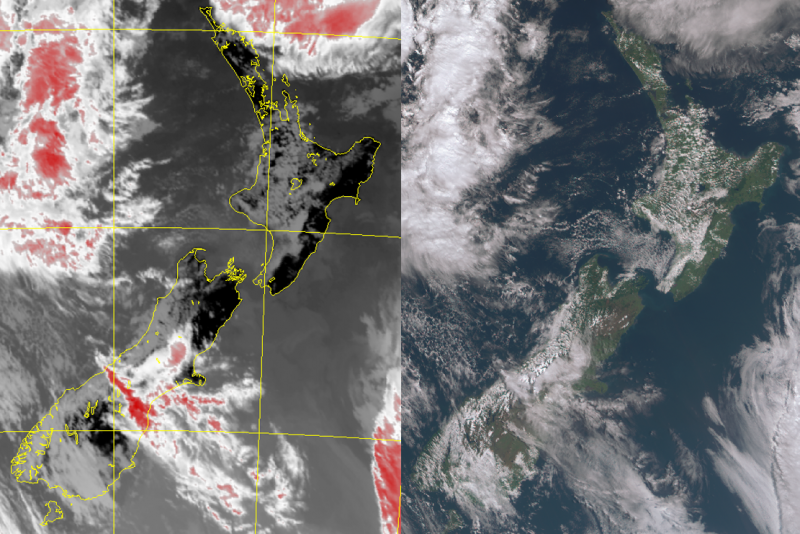 A lot of the weather originates high above this layer, but the boundary layer is the part of the atmosphere which is most affected by New Zealand's terrain. 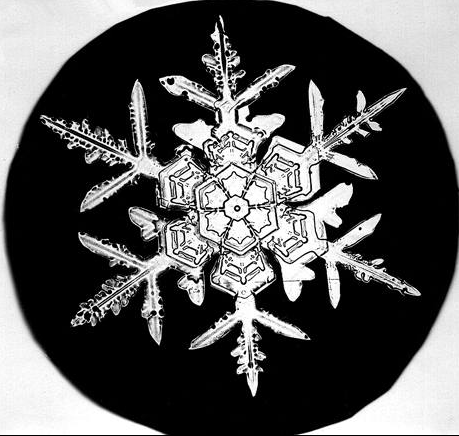 A photo of a ‘dendritic’ snowflake, taken by Wilson Bentley. During the second semester at university, the trainees also complete two more simulation weeks. During the second and third simulations, the focus is more on forecasting. Our trainees have just finished their second simulation last week, which brings us back to the present week – shift familiarisation. Lead Meteorologist Mike O’Connor showing Trainee Meteorologist Juli Bergdolt how to draw weather maps. 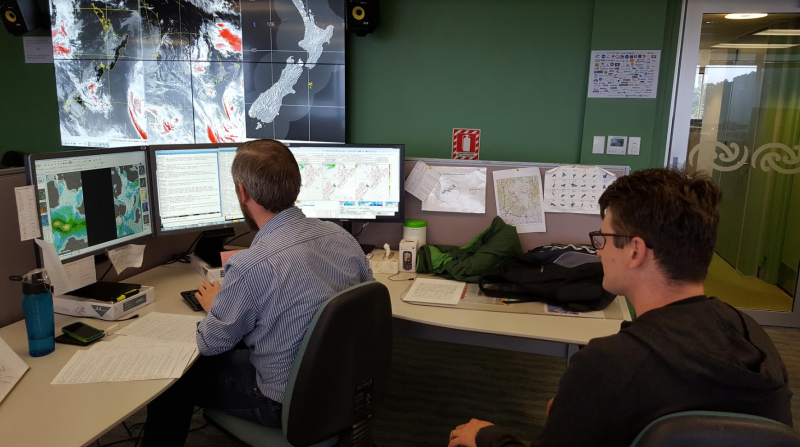 Meteorologist Josh Griffin writing forecasts for metservice.com, while Trainee Meteorologist Andrew James observes. After the trainees have sat their final exams at the end of the year, the final stage of their training to complete their Masters course involves a research project, which will be completed in Autumn 2018. While the training is intensive, and it takes a long time to become fully qualified, it can lead to a long and rewarding career as a meteorologist, producing weather forecasts for TV, Radio, Newspapers, Airlines, Ship Captains, Civil Defence, Search and Rescue, just to name a few! If you think that becoming a meteorologist sounds like the job for you, you can find out more here.